On Sunday we enjoyed our last competition of the year. Nine teams set out to Cha Cha Cha around 11 holes in sunny, calm conditions, novelty hats and Christmas jumpers. We then adjourned for a well-earned meal and a good ole natter. It was good to see so many there including some of our Ladies we hadn't seen for a little while! The winners were Nancy, Sam and Joyce, runners up Margaret Ross, Ali and Fiona (one of our new members), third place went to Louise, Carol and Anne Wood. 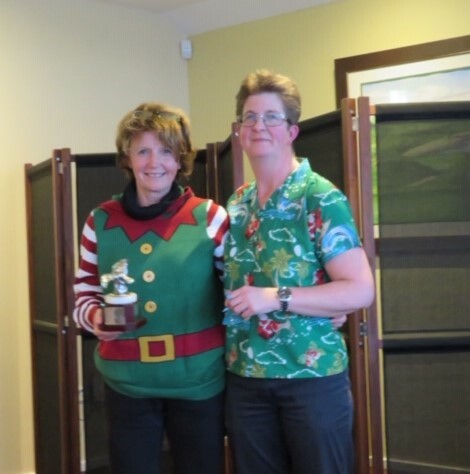 June took prize for Best Christmas Jumper chosen by Clint. Finally, winner of the Order Of Merit was Sam. Congratulations to all our winners today and throughout the year. It's been a great season, roll on 2019 so we can do it all again!